Businesses have been moving towards Cloud Computing at a rapid pace. There are many estimates on how quickly this is accelerating but the consensus is somewhere between 20% and 30% year over year growth for AWS and Azure. Cloud Computing has distinct advantages including the utility usage of storage and processing power, redundancy, and efficiency. For these reasons, Cloud Computing has typically stood out over traditional on-premise infrastructure which can be burdened by technical complexity, high acquisition costs, and inefficient usage of hardware / lack of scale. 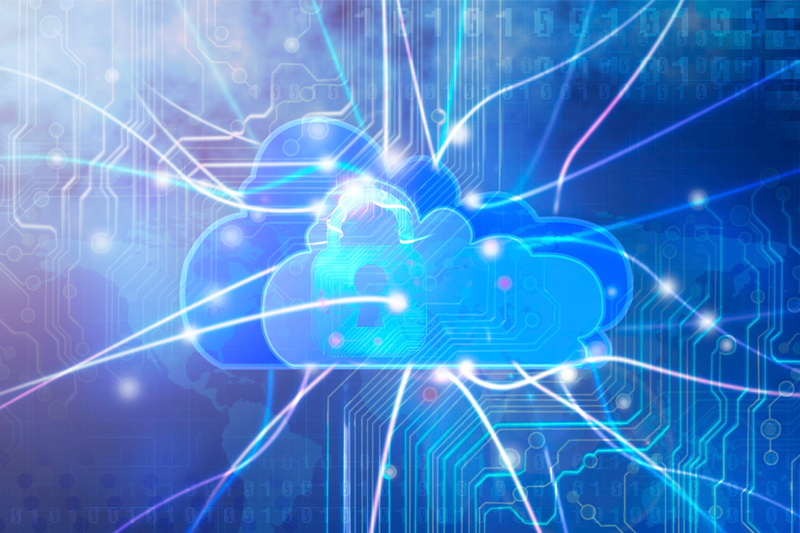 What if the benefits of Cloud Computing could be implemented in an on-premise solution? This powerful combination is a compelling option to consider for many organizations facing future IT infrastructure decisions. Scale Computing, a company based in Indianapolis, is redefining the way IT runs from the ground up, delivering many of the benefits of Cloud in an advanced hyper-converged package that meets the needs of mid-market and SMB organizations. Their mission is to challenge traditional thinking about IT infrastructure and provide an alternative to complex (and costly) infrastructure solutions. The tried and true on-premise infrastructure for mid-market and SMB organizations has generally revolved around Physical Server Hosts, SAN / NAS, Networking, VMware Virtualization, and Backups / DR. This has been an established architecture for over 15 years. Each of these components has several competing vendors like HP, Dell EMC, Cisco, NetApp, etc. which makes it difficult to establish consistency with any given implementation. You can try compatibility guides or find information online, but you are pretty much left to your own devices to make this solution work and then support and update it going forward. As you can imagine, there will be multiple sets of patches or firmware to apply independently, leaving open the possibility for conflict. And if you need to contact support, where do you start? Each one of them may point the finger at the other, complicating the path to resolution when things go wrong. To define how the Internal Cloud can be a reality, we need to start with the Cloud Computing hypervisor of choice. Many of the Cloud Computing giants like Google and Amazon have adopted KVM Hypervisor in their datacenters. Even Apple has replaced VMware with KVM and in the process saving $30 million USD annually in licensing. KVM stands for Kernel-based Virtual Machine but in essence, this is a virtualization module built into Linux that allows it to function as a hypervisor. Due to the open source nature of Linux this has quickly spawned off many iterations of KVM in Solaris, BSD, OS X, and even Windows. Although it is hard to determine exact numbers, the market share for KVM in the hypervisor market has grown substantially as Senior IT Leadership has become increasingly weary of expensive license costs. The Scale Computing HyperCore operating system runs on KVM hypervisor so the first block of the Internal Cloud is in place. While the market share for traditional server and storage infrastructure has eroded, the hyperconverged space has been growing at 48% annually, and expected to hit $11 billion in 2021. 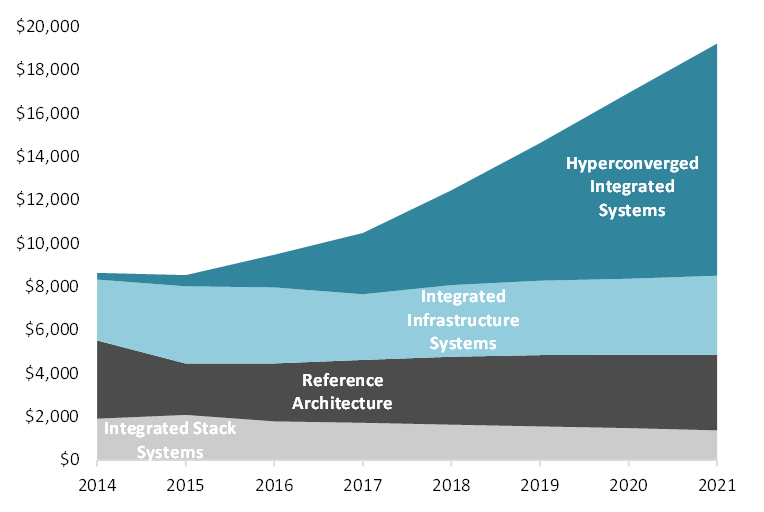 Hyperconverged is the integration of compute, storage, and virtualization layers of infrastructure into a single solution architecture, greatly simplifying deployments and operation. 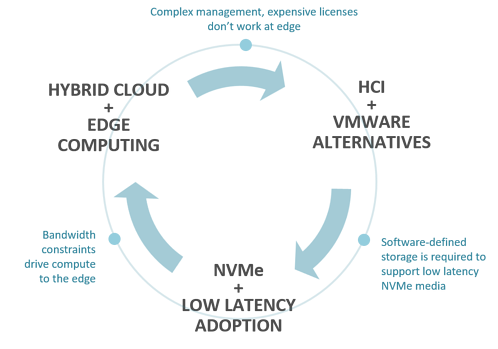 It also scales seamlessly and incorporates clustered high availability, much like the abstraction found in Cloud Computing. Unlike other “cloud in a box” solutions that have proceeded it, namely the preconfigured rack or converged, hyperconverged incorporates the most complete single-vendor solution that includes virtualization instead of a separate license. Scale Computing coined the word hyperconverged and they are the established leader in this space with over 10,000 units in production. With all the technology packed into this Internal Cloud solution, you may think that it would come at the expense of incredible technical complexity. From the ground up, Scale Computing has engineered HC3 to be simple to manage through self-healing technology and an operating experience that requires no specialized storage or VMware administrators. Maintenance tasks are automated, and utility assignment of RAM – Disk – CPU through a simple web-based management interface. Scale Computing creates a flexible, redundant, and elastic Internal Cloud solution, rivaling any major Cloud Computing environment. There is no separate management server to buy and failover of VMs in the cluster are automatic. Our Internal Cloud Computing infrastructure wouldn’t be complete without low latency storage. While most Cloud hosts have solid state drive “Premium Disk” options available, we are only beginning to see NVMe drives hit the market. 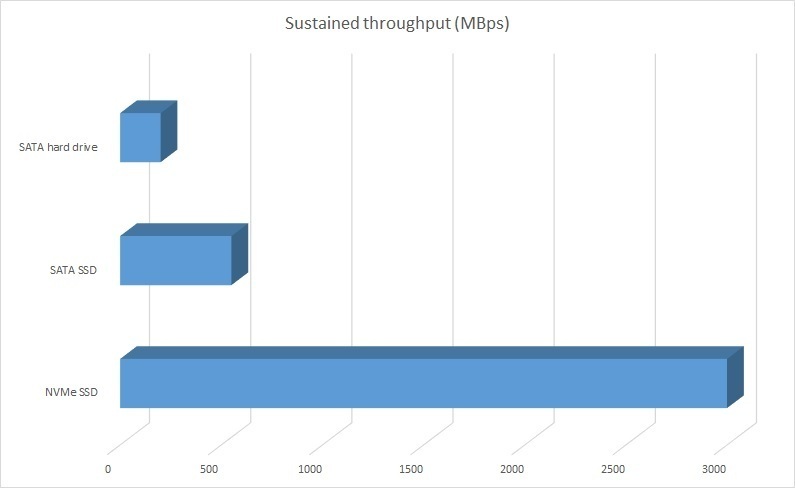 Not only does this represent a quantum leap ahead in IOPS, the latency can be as low as 20µs vs. 300µs or more for SSD. This is an incredible performance improvement, enabling near bare metal data pathing. Scale Computing enables NVMe (Intel Optane P4800X) over fabric (NVMe-oF) in optioned HC3 clusters, further enhancing the Internal Cloud solution, the equivalent of a RAID array for NVMe. With all the technology packed into this Internal Cloud solution you may think that it would come at the expense of incredible technical complexity. From the ground up, Scale Computing has engineered HC3 to be simple to manage through self-healing technology and an operating experience that requires no specialized storage or VMware administrators. Maintenance tasks are automated, and utility assignment of RAM – Disk – CPU through a simple web-based management interface. Scale Computing creates a flexible, redundant, and elastic Internal Cloud solution, rivaling any major Cloud Computing environment. There is no separate management server to buy and failover of VMs in the cluster are automatic. By combining these components into a single solution, the cost of a Scale HC3 is significantly lower than traditional infrastructure comprised of Servers, SAN, and VMware. Scale is at the nexus of several major industry trends, making the solution much more flexible and future proofed. It is also comforting to know that they have 24/7 support delivered from their US based headquarters. Unlike almost every other hardware or software vendor, they only offer one support plan (called ScaleCare) so every client is treated with the same high priority. There are no tiers or other support enhancements to pay for, and all calls are answered by Senior Support Engineers based in Indianapolis. They have secure remote access to the HC3 system for near real-time support. Moving to a hyperconverged solution from Scale Computing is easier than you might expect. HC3 Move is a migration assistance utility that will help automate the migration of a handful or even hundreds of VMs to a Scale HC3 cluster. HC3 Move migrates the entire system or just file or application data for standard or custom file and application servers and even domain controllers. Having an Internal Cloud Computing environment is truly within reach and more affordable than you may expect. Going pure Cloud Computing isn't the right fit for every company; whether it be Internet / bandwidth constraints, a preference for owning infrastructure, or performance considerations for specific applications or services, finding that right fit can be challenging. 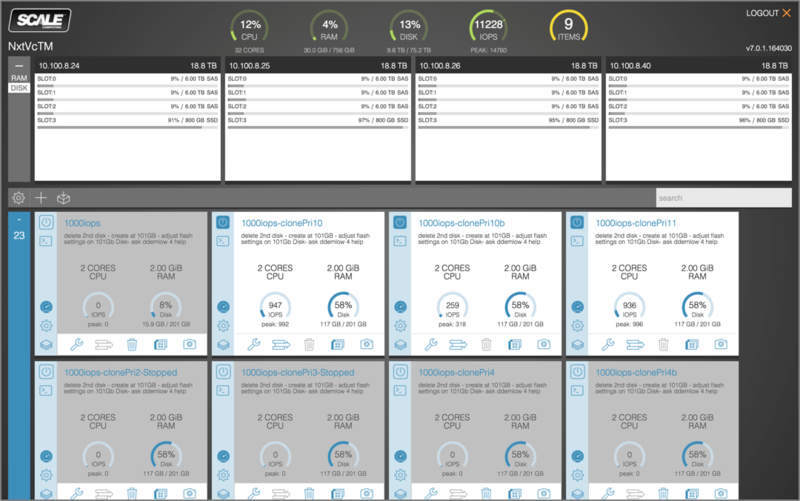 The Scale Computing HC3 hyperconverged infrastructure allows you to take advantage of the best of Cloud Computing architecture in an elegant in-house solution.